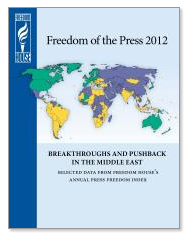 The year 2011 featured precarious but potentially far-reaching gains for media freedom in the Middle East and North Africa. Major steps forward were recorded in Egypt, Libya, and Tunisia, where longtime dictators were removed after successful popular uprisings. While trends in these countries were not uniformly positive, with important setbacks to democratic prospects in both Egypt and Libya toward year’s end, the magnitude of the improvements—especially in Tunisia and Libya—represented major break­throughs in a region that has a long history of media control by autocratic leaders. The gains more than offset declines in several other countries in the Middle East. And even the great­est declines, in Bahrain and Syria, reflected the regimes’ alarmed and violent reac­tions to tena­cious protest move­ments,­ whose bold demands for greater freedom included calls for a more open media environment. The improvements in the Arab world were the most significant findings of Freedom of the Press 2012: A Global Survey of Media Independence, the latest edition of an annual index published by Freedom House since 1980. The gains came on the heels of eight consecutive years of decline in the global average press freedom score, a phenomenon that has affected practically every region in the world. Three of the countries with major gains—Burma, Libya, and Tunisia—had for many years endured media environments that were among the world’s most oppressive. Both Libya and Tunisia made single-year leaps of a size practically unheard of in the 32-year history of the report. Furthermore, they were accompanied by positive changes in several key countries outside the Middle East and North Africa: Burma, Indonesia, the Philippines, Thailand, and Zambia. Other countries that registered progress include Georgia, Nepal, Niger, Sierra Leone, and Togo. At the same time, press freedom continued to face obstacles and reversals in many parts of the world. China, which boasts the world’s most sophisticated system of media repression, stepped up its drive to control both old and new sources of news and information through arrests and censorship. Other authoritarian powers—such as Russia, Iran, and Venezuela—resorted to a variety of techniques to maintain a tight grip on the media, detaining some press critics, closing down media outlets and blogs, and bringing libel or defa­mation suits against journalists. Another disturbing development in 2011 was a decline in press freedom in several well-established democracies, most notably Chile and Hungary. As a result of status downgrades in a number of previously Free countries over the past few years, the proportion of the global population that enjoys a Free press has fallen to its lowest level in over a decade. The report found that only 14.5 percent of the world’s people—or roughly one in six—live in countries where coverage of political news is robust, the safety of journalists is guaranteed, state intrusion in media affairs is minimal, and the press is not subject to onerous legal or economic pressures. Deterioration was also seen in a number of Partly Free media environments, such as Ecuador, Macedonia, Malawi, Uganda, and Ukraine. Of the 197 countries and territories assessed during 2011, including the new country of South Sudan, a total of 66 (33.5 percent) were rated Free, 72 (36.5 percent) were rated Partly Free, and 59 (30 percent) were rated Not Free. This balance marks a shift toward the Partly Free category compared with the edition covering 2010, which featured 68 Free, 65 Partly Free, and 63 Not Free countries and territories. The analysis found that only 14.5 percent of the world’s inhabitants lived in countries with a Free press, while 45 percent had a Partly Free press and 40.5 percent lived in Not Free environments. However, after eight years of decline in the global average score, including particularly steep drops in 2007, 2008, and 2009, there was a slight improvement of 0.14 points for 2011. This break from the negative trend was driven by a significant net improvement in the Middle East and North Africa, coupled with a more modest improvement in the Asia-Pacific region. In terms of thematic categories, the global average score improvement appears to stem from gains primarily in the legal category, and secondarily in the economic category. The political category showed a global decline when compared with the previous year.